As I browsed through recipe after recipe, I looked for common themes and similarities. It seems to me that these are the ones that are closest to "the classic" one that everyone's Grandma used to make. I think this recipe falls neatly into that category. (I found it on another blog called SmittenKitchen.com. I'm sure they won't mind if I share it with you!) I love that it's pretty simple to just throw together. Oh, and it smells HEAVENLY while it's baking!! 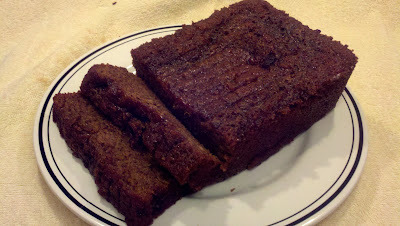 So, whether you're celebrating Rosh Hashanah and hoping for a sweet new year, or just looking for a deliciously moist lightly spiced cake to have with tea, this is the one for you. Yes, Terri, I know it has several ingredients, but they're all readily available at your local market and I'll just bet that you already have many of them in your pantry. So there. Generously grease pan(s)* with non-stick cooking spray. For tube, loaf, or angel food pans, line the bottom with lightly greased parchment paper, cut to fit. Using a strong wire whisk or in an electric mixer on slow speed, stir together well to make a well-blended batter, making sure that no ingredients are stuck to the bottom. Pour batter into prepared pan(s). Sprinkle top of cake(s) evenly with almonds, if using. Place cake pan(s) on two baking sheets. Bake until cake tests done, that is, it springs back when you gently touch the cake center. For angel and tube cake pans, this will take 60 to 75 minutes, loaf cakes, about 45 to 55 minutes. For sheet style cakes, baking time is 40 to 45 minutes. Let cake stand fifteen minutes before removing from pan. *This recipe originally stated that it would be enough for three loaf pans, but I only used two, and it was exactly the perfect amount. I guess I have larger loaf pans?? Anyway, you can also use two 9-inch square or round cake pans, one 9 or 10 inch tube or Bundt cake pan, or one 9 by 13 inch sheet cake. I chose to bake it in loaves because (correct me if I'm wrong) I believe that that's how it's traditionally served. -I must confess, I didn't follow the directions exactly. I sifted the dry ingredients in one bowl, whisked the wet ingredients in another bowl, and the poured the wet into the dry as the mixer was mixing. Worked perfectly fine! -The easiest way to line the pan with greased parchment paper: Cut a piece to fit the bottom of the pan. First spray the pan, then place the parchment in the bottom, then spray the parchment. It's worth doing this because this is a really sticky cake and you want to make sure it comes out of the pan. If your cake still comes out in pieces, don't fret. It's sticky enough that you can literally just stick it back together. -Since I'm not a whiskey drinker, I didn't want to buy a whole bottle just for a 1/4 cup. So, instead, I bought one of those little tiny shooter bottles. Ya know, like they serve on an airplane... Can you guess how much is in one? YUP... 1/4 cup!